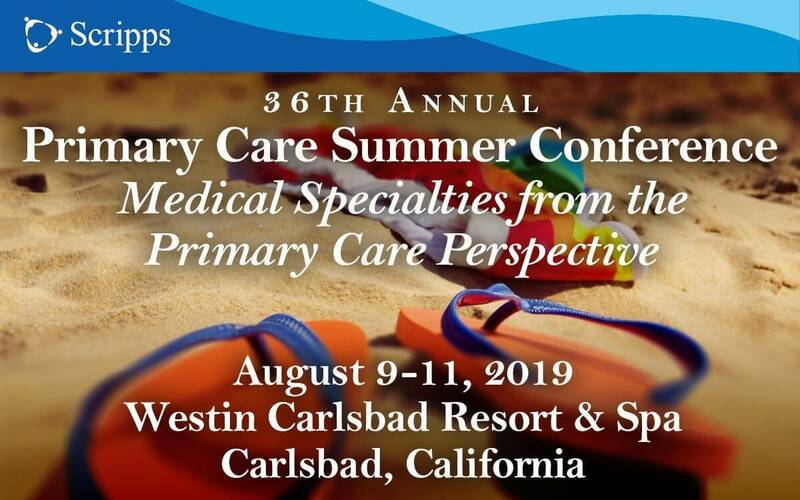 Scripps Health’s Primary Care Summer Conference was designed by primary care physicians for primary care physicians and will present content from their unique perspective. This important CME conference will educate and promote improved patient outcomes in a broad range of therapeutic areas commonly encountered in the busy primary care practice. In addition to an overview of the history and current science of a variety of specialty areas, content will be presented in a very practical, patient-focused manner relevant to the specific primary care setting and challenges. Discuss the history, science and evidence of commonly encountered therapeutic areas. Integrate current trends in preventive health care into patient care strategies. Diagnose frequently encountered medical conditions using office examinations and formal diagnostic techniques. Formulate a comprehensive treatment program for various health issues, coordinating other team members within the practice to support the patient care strategy. Manage the specialist referral process: assess when to refer, recognize what the specialized treatment will consist of, and determine the role of the primary care physician in cohesive care and follow-up. Identify common overlapping or related conditions. Access and/or recommend resources for both physicians and patients to acquire additional information pertinent to a range of therapeutic areas. Effectively discuss with patients their personal responsibilities in prevention and treatment. Scripps Health is accredited by the Accreditation Council for Continuing Medical Education (ACCME) to provide continuing medical education for physicians. Scripps Health designates this live activity for a maximum of 15 AMA PRA Category 1 Credit(s)™. Physicians should only claim credit commensurate with the extent of their participation in the activity. Dermoscopy and Melanoma: What Is It and Why Do It? Dermoscopy and Melanoma: How Do I Start?